GreenTech Environmental develops some impressive products. And, their GT 3000 professional-grade air purifier is remains one of our top recommended purifiers. Granted, their design is a bit dated, but finding a purifier this size to cover 2,500 to 3,000 square feet is a tall order. And, according to GreenTech, the GT 3000 also provides protection against a wide range of airborne pathogens and pollutants. Like many other quality units, this purifier is great at removing dust, pet dander, and pollen. GreenTech points out that this model also effectively defends against airborne mildew, mold, salmonella, and e-coli. To battle these airborne hazards, the GT 3000 makes use of 4 distinct technologies. But, we’ll get to those later. GreenTech Environmental calls Gray Tennessee home. And, their founder Allen Johnston continues to build an organization dedicated to improving the quality of life through the use of natural technologies. Johnston built an impressive resume in the defense industry, but shifted his focus when his mother was impacted by environmental illness. After her passing, Johnston set out to find natural ways to battle a wide variety of ailment inducing pollutants. He spent more than a decade helping another company develop similar products. But after it closed its doors in 2009 he decided to continue his work by starting GreenTech… in his basement. Fast forward to today and you will see that his passion to help improve health built a successful organization. And, that thier product line now extends beyond air purification systems like the GT3000. In fact, GreenTech now produces water purifiers, lighting solutions, heaters, and whole home energy management products. Greentech experiencing significant growth, and the GT 3000 air purifier continues to sell. But, we’re most impressed by Allen Johnston’s dedication and resolve. GreenTech has a purpose and they really stand behind their products. 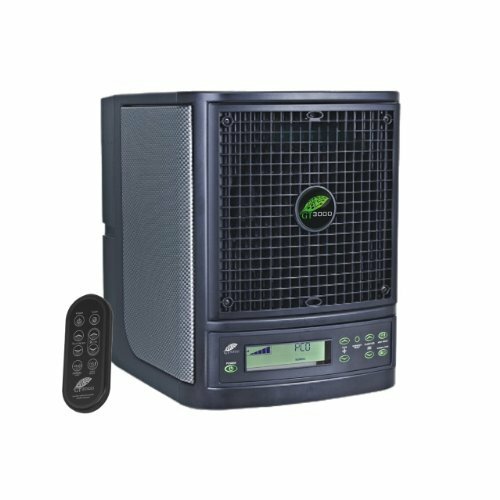 The GT 3000 air purifier (now the PureAir 3000) packs a lot of features into a reasonably priced package. To improve indoor air quality it combines four technologies, each selected to help provide a natural, healthy, and clean air environment. And, while many gt-3000 reviews blindly endorse each of these as a miracle in air purification we do want to urge you to educate yourself before purchase. The team at PureAirSupply.com is very cautious about recommending any product that produces Ozone. And, while this product works wonderfully and Ozone is a powerful tool; we want you to understand that it can be harmful if used incorrectly. Rather than go into great detail here we recommend visiting the EPA’s page on Ozone in Air Purifiers. With that said… here are the four technologies GreenTech incorporates into their air purifiers. This technology destroys bacteria and other harmful pathogens through a process called molecular disassociation. The basic premise is that molecular disassociation actually breaks down unsafe molecules; leaving behind less harmful elements rather than harmful molecular compounds. And, as you can probably imagine altering an organism’s molecular structure isn’t good for said organism. So long bacteria! The GT3000 Air Purifier (PureAir 3000) uses ionization to created negative ions. Their negative charge attracts harmful pathogens, allergens and dust like a magnet. The clumped together airborne particles are much easier for a purifier to capture. Or if they sneak through, more often than not, they fall to the floor. It’s a good way to address the things HEPA Filters might miss (particles smaller than .3 microns). And, since some of the nastiest airborne pathogens are way smaller than .3 microns this ultimately means less bacteria and viruses floating around your home or office. When you set the GT3000 into “High Mode” this activates Ozone to tackle mold and stubborn odor. We really have to recommend that if you use this powerful tool, you need to understand its risks. And, if possible use while you’re away from the space being cleaned. This technology backs up the purifier’s needlepoint ionization. Basically, it helps to clean out the purifier by gathering the clumped together particles after needlepoint ionization. Periodically you just remove the filter and give it a rinse. Away mode allows you to use Ozone to clean and purify when no one is the around. It’s a smart feature considering the fact that Ozone irritates sensitive respiratory tracts. In “Away Mode” you select from 4 timer controlled settings, ranging from 2 to 8 hours. This provides maximum output,while you’re away. Like we said earlier… educate yourself about Ozone producing machines. And never, ever, use this feature while you or your loved ones are present. The GT3000 comes with a full functional remote control that allows you to change into Normal Mode, High Mode and Away Mode, allows you to choose fan speeds and can dim the lights for a better night’s sleep. It’s great to have everything right at your fingertips. The GT3000 is small enough to be relatively portable. It’s ideal for homes and offices, but works well in RVs, boats, and travel trailers as well. We actually think the best use might be in boats and RVs. Especially when they go into storage. Every Snowbird knows that when not in use, an RV or boat can become quite musty. And, this unit’s technology is great for that application. GreenTech’s larger purifier, the GT 3000 is great for many situations and use cases. Despite our tendency to shy away from anything that produces significant levels of Ozone for safer options… we admit this is a powerful tool. But, like any powerful tool it must be used with care and responsibility. If you’re that doesn’t work for you we recommend looking into products from Alen ,Blueair, or Rabbit Air. However, if you understand the dangers and accept the responsibility; this product gets results. And, consumers love these machines. They’re reliable, eco-friendly, and incredibly effective. The PureAir 3000 (GT3000) isn’t a cheap purifier. But, we really do consider it as a value priced model, well worth the expense. You cannot put a price on good air quality or your health. But, if for some reason you do… we recommend looking at the GermGuardian 4825 it’s nowhere near as effective, but at a fraction of the price it does offer a lot of great features. But, if you want something really powerful… you should consider the GT-3000 from GreenTech Environmental. When we revised this article we went back and read a bunch of new reviews. We were not surprised to see that it’s still highly rated on a number of sites. However, the negative reviews appear to come from people who don’t understand Ozone and how it works. We said it earlier, but want to really stress that before you buy this make sure you understand Ozone. If you do we’re certain you’ll be pleased with your purchase and will likely join the growing number of GreenTech Environmental fans. Editor’s note: We originally published the review of the GT3000 Air Purifier in April of 2015. However, we revisited the product in 2019 and completely revised the original article for accuracy, relevance, and in consideration of new developments in purifier technology. Also, despite the recent name change to “PureAir 3000,” we decided to keep the original name “GT3000” in the article to help consumers find the information they’re looking for.